How many calories burned on treadmill desk vs standing desk? Sitting disease, in a nutshell, is a wind-down of the body’s metabolism that occurs when we sit for too long at one time. The most direct effect is a lowering of the body’s “resting rate,” called the basal metabolic rate (BMR). Think of it as your heart rate when you’re just sitting still. We burn a few calories just keeping the vital organs working, digesting our last meal, pumping blood through the veins, exercising the brain cells, etc. Merely standing raises the body’s BMR significantly, as the heart has to work harder to keep the body erect. Walking at a slow pace of 1 to 2 mph raises the BMR further still, and with it, our background calorie burn. The Mayo Clinic’s Dr. James Levine—the “father of the treadmill desk” and author of Move a Little, Lose a Lot—estimates this burn rate to be between 100 to 130 calories per hour. The graph below, adapted from Dr. Levine’s book, depicts the difference in metabolic rate acceleration induced by various activities. 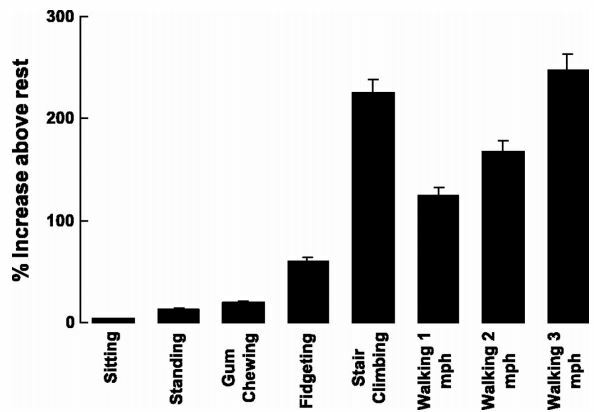 You can see how modest the metabolic increase is from using a standing desk as compared to walking very slowly while working, and fidgeting and chewing gum will burn more calories than simply standing. The optimal calorie burning zone is achieved in the range of a 1 to 2 mph slow walk. While such a burn rate can significantly aid in weight loss, other health benefits of using a treadmill desk are much more meaningful and achievable. Weight loss is typically not something associated with the use of a standing desk, although other health benefits are well documented. To learn more, see our blog article comparing the differences between standing desks and treadmill desks. Most treadmill desk users do report very moderate weight loss as a result of their new regimen. Crash diets and crash exercise programs can have some very negative health effects, too, so a very gradual loss rate is actually a good thing to strive for. The primary goal for using a treadmill desk shouldn’t be weight loss but rather the reversal and prevention of sitting disease. In the process of reviewing the various treadmill desk vendors, we often wonder whether some of them have actually read any research on the true health benefits of treadmill desking before crafting their marketing pitches. For that matter, we question whether they even read their own users’ reports posted all over the internet. Treadmill desk marketers who promote weight loss as the first bullet point on their list of product benefits are missing the point and potentially setting inappropriate expectations with their customers. Treadmill desks help us cope with the fact that our BMRs decline as we age. The only indicator that really matters is the clock showing how many hours you replaced sitting with moving. This is the primary health benefit of treadmill desks. Moderate weight loss is one of the many long-term benefits treadmill desk users will enjoy along with improvements in blood pressure, triglycerides, cholesterol, focus and productivity, as well as prevention of thrombosis, low back pain, and other aches and pains caused by the overuse of our chairs and sofas. Both standing desks and treadmill desks are terrific tools for raising your BMR above the subdued level experienced when sitting for prolonged periods of time. 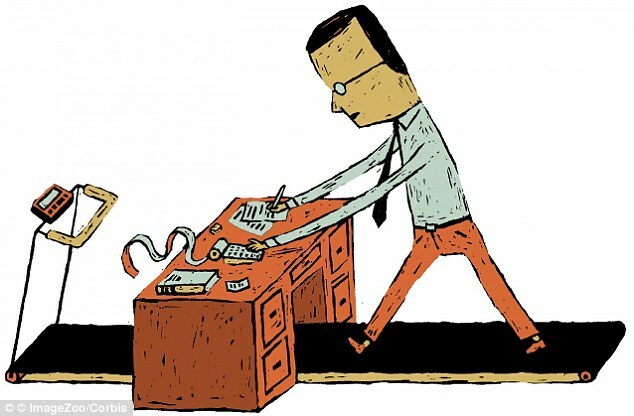 While aiding weight loss isn’t the primary health benefit of using either device, there is definitely a difference between the caloric burn rate when working while standing versus working while walking. In both cases, the aim is to remain in the “NEAT Zone” and not raise your heart rate into the sweaty and focus-diffusing aerobic exercise zone.